At the Transformers: The Game preview event, the versions of the game that struck me as the most ambitious were the Nintendo DS games. Featuring plots with looser connections to the movie, somewhat intertwining storylines, and healthy chunks of wonderfully acted dialogue, the DS games proved to be my favorite versions released. I�m reviewing both simultaneously, because they�re essentially the same except for factions online and the plot. I won�t get into plot details in this review, but both games feature characters that you have a great deal of creative control over and the stories are much stronger than your average licensed game, or even many �original� games. Every Japanese RPG with a character named, �Elena,� I�m looking at you. If you�ve read my review of the console version of the game, you know how high I value good gameplay and how disappointed I was with it in that release. I�m happy to say that for all the things wrong the console version does, the DS games do those right. Ranged combat will actually hurt enemies, but sometimes melee is better. Boss fights are actually tests of skill, and not just mindlessly repetitive puzzles. 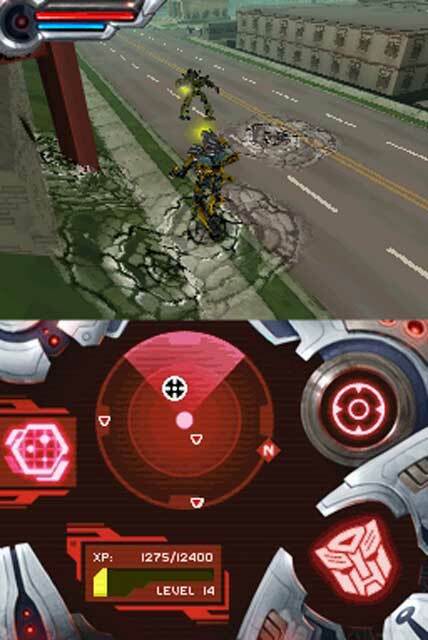 The combat works in this game and it�s as fun as any other action game on the DS. The mission system in the DS games are similar to that of the console, although the missions are completely different and short enough for a handheld system. There could have been a bit more variation, but the game is undeniably fun. The best part of the game is choosing alternate modes and having an almost RPG-like control over your character. Not only can you choose your alt. modes, but you can tweak the colors to your liking as well. The online component is interesting and ambitious, but it didn�t keep my attention for very long. If you do a lot of online gaming on your DS, the challenges are an entertaining diversion and the interaction with the websites is cool. I play a ton of games, though, so I only stayed with it for a few days. Like the console version, I didn�t take issue with the controls. They get the job done well, and the touchscreen elements didn�t feel gimmicky. Touch part of the screen to transform, touch an icon to scan, etc. The sound effects and music were good, but where the audio really shines is the lines upon lines of recorded dialogue. Well-acted, well-written and it greatly added to my enjoyment of the game. I wish Keith David didn�t sound like Halo 2�s Arbiter when he�s playing Barricade, though. The graphics, as I think I mentioned in my preview, are among the best 3d graphics I�ve seen in a DS game. They�re about Playstation 1 level, but that�s still pretty good for a handheld and they�re impressive in their own right. I wish more animation could have been put into the Transformations, but I guess that hit hardware limitations. 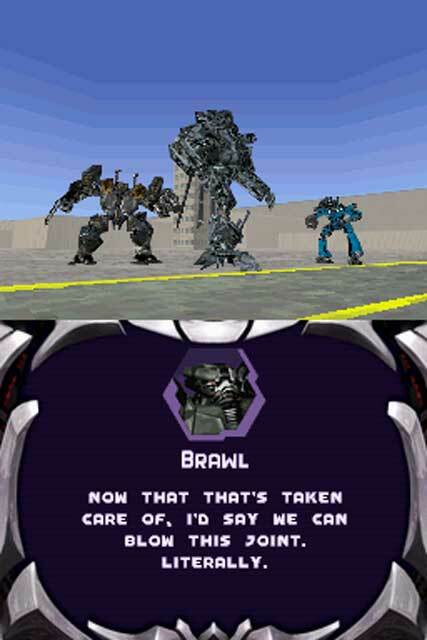 I would recommend this game to Transformers fans as well as anyone who has a DS and is looking for a fun action game. There isn�t a huge amount of variation in the games, but they do deliver handheld friendly bits of quick fun.